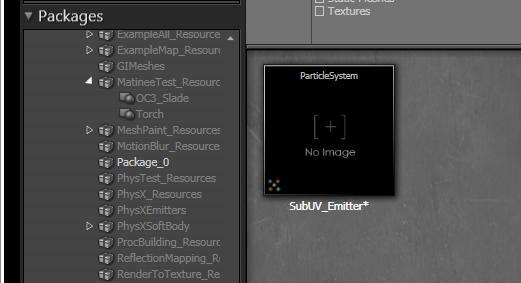 The Unreal Engine's Particle System provides an emitter TypeDataModule that allows for the selection of sub-images from a source texture to be displayed on its particles. It works by allowing you to select the sub-image to display for a particular particle as a function of the lifetime of the particle. 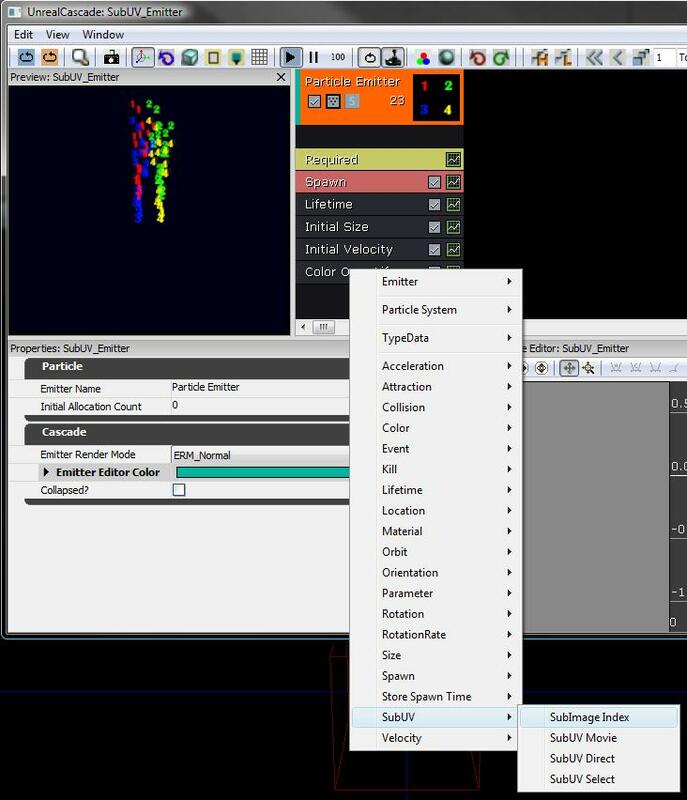 See the CascadeUserGuide for a general description of the Cascade Particle Editor. This document assumes you are familiar with the Content Browser, and with creating packages and objects within those packages. 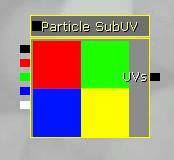 In this example, we will be using a simple 'subdivided texture' called ColorQuads. 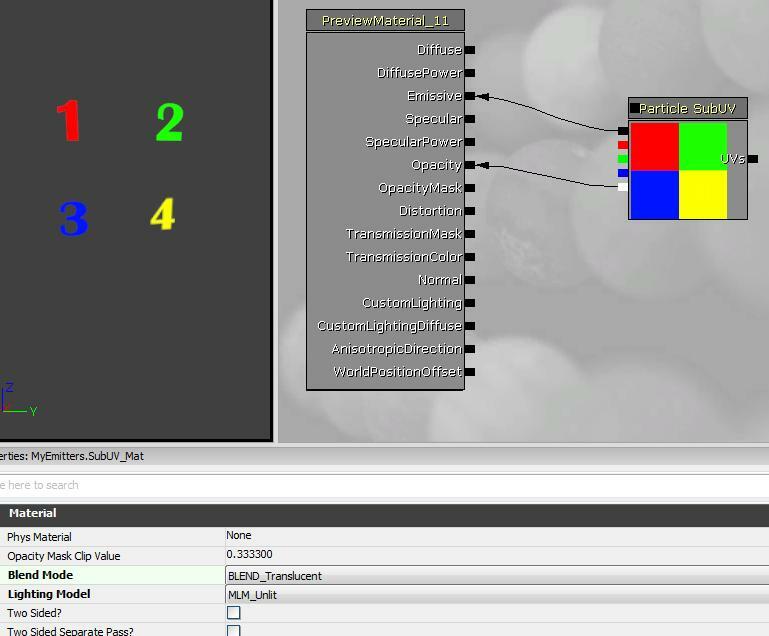 The texture consists of a simple quartered color square scheme, with the alpha channel embedding the numbers 1, 2, 3, and 4 in each sub-square from left-to-right and top-to-bottom. 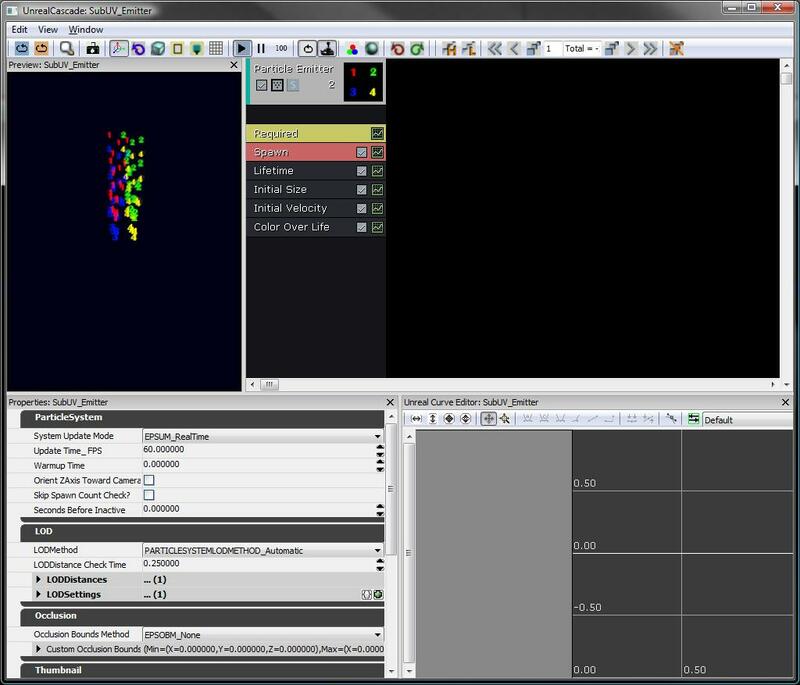 This image allows for simple verification that the sub-image system is working. 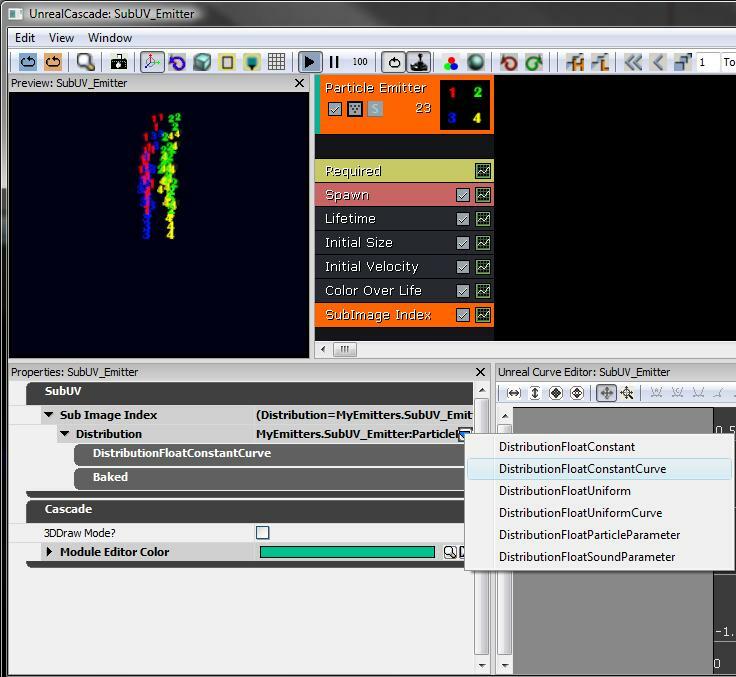 The next step is to create a material that will be applied to the sprites generated by the particle emitter. 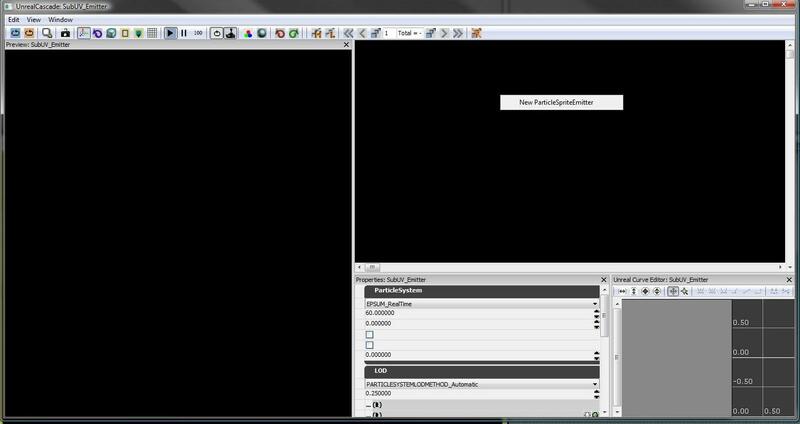 Right-click in the MyEmitters browser window and select "New Material". 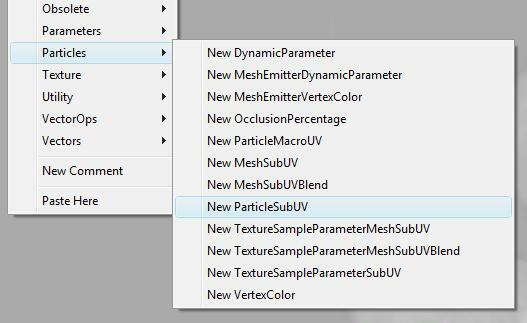 Name the material "SubUV_Mat" and open it in the Material Editor. 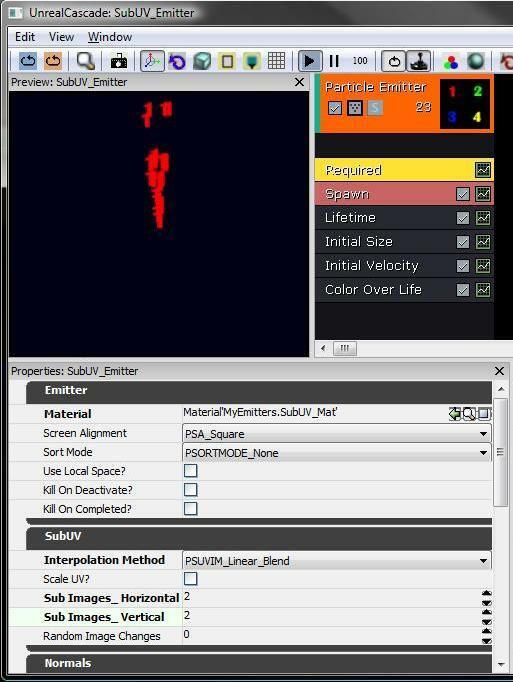 Located in the 'Required' class are the SubUV-related settings: the InterpolationMethod, and the Horizontal and Vertical sub-image counts for the texture. This informs the emitter that the sub-images are laid out in a 2x2 grid, and that the interpolation should be in a linear fashion between sub-images. 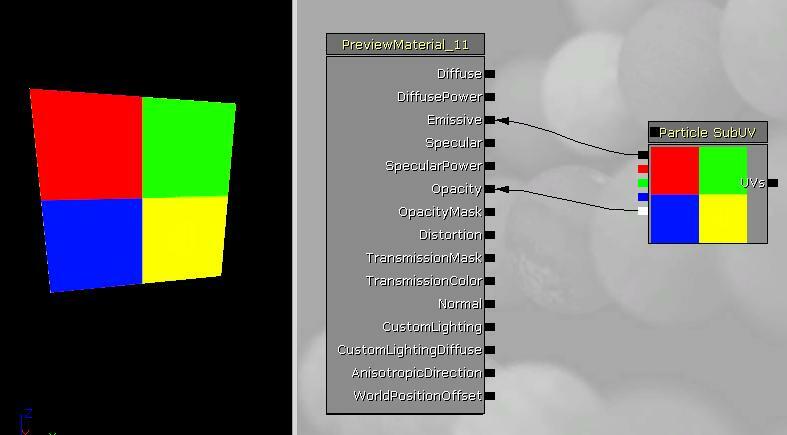 As you can see, the emitter is selecting the `first' sub-image for the supplied texture, as the default sub-image index will be a constant 0. 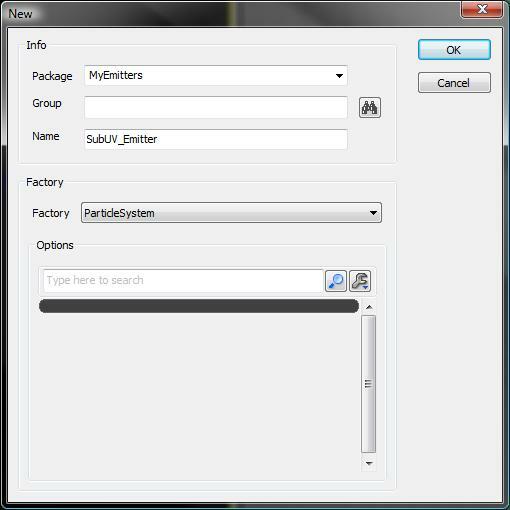 Add a SubImage index module to the Emitter by right-clicking and selecting it from the list. 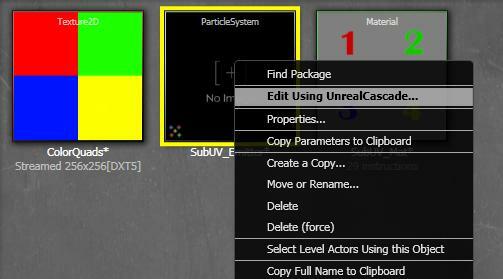 The properties for this module will now be displayed in the lower-left panel of Cascade. There is only one piece of information contained in the SubImageIndex module, and that is a scalar distribution named "SubImageIndex". Switch the distribution to a Constant Curve by clicking on the blue arrow and selecting it from the list. 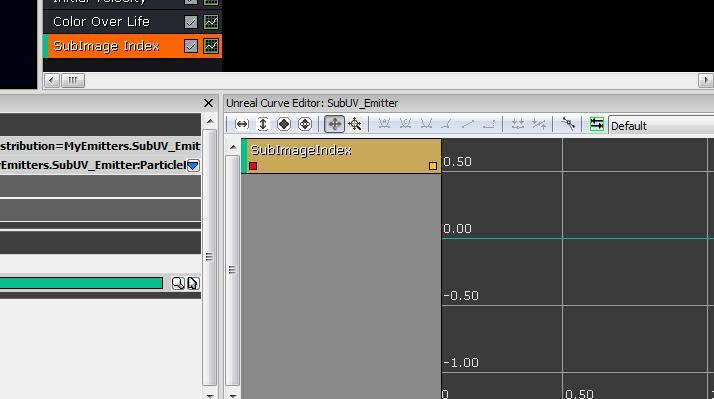 Click on the small green 'graph button' on the SubImage Index module of the emitter to add the curve to the curve editor. The MyEmitter package is available here.